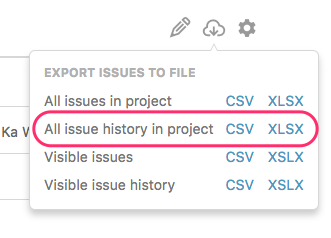 You can export issues from DoneDone as Excel (XLSX) or comma-separated (CSV) flat files. To export issues, navigate to an issue list on your global or project-specific dashboard. The click the Export icon to the right. If you are on the global dashboard, you can either export all issues in the account, only the ones that are currently visible, or the ones that are currently visible including their history (comments, updates, etc.). To display more visible issues, scroll to the bottom of the page and wait for the issue list to load more issues. If you are on a project-specific dashboard, you'll have the option of exporting all issues in the project, all issues including history, visible issues, or visible issues including history. Click either the CSV or Excel link to download the export.